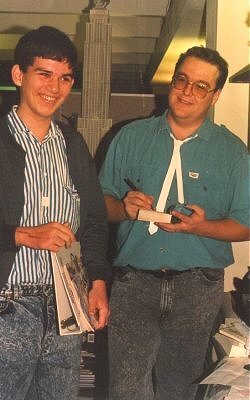 Jeff Grubb signing my copy of his 1988 Forgotten Realms novel Azure Bonds. 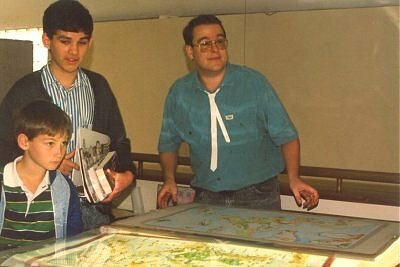 Jeff Grubb with the original map of the Forgotten Realms world. This map was designed by that fantasy world's creator - Ed Greenwood, a Canadian - back in the 1960s. Jeff was in frequent contact with Ed when working on products related to that world. In 1989, Jeff was the overseer of the development of the Forgotten Realms in the AD&D game. Outside Jeff's cubicle. The interior was very cluttered and was equipped with a computer. 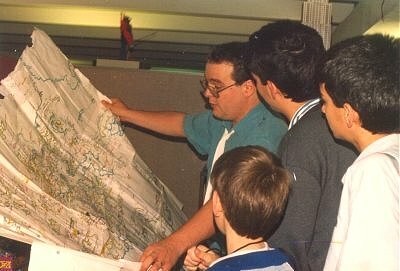 Jeff Grubb showing me the fantasy world mapping department. 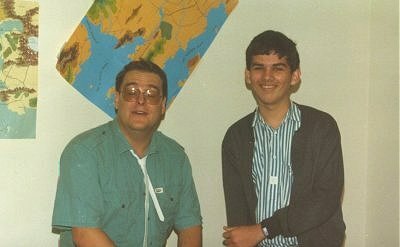 Me and Jeff Grubb in a TSR office with Forgotten Realms maps plastered all over the walls. 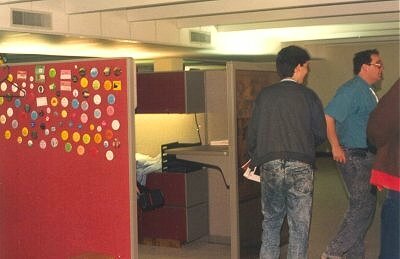 Most offices/cubicles had the 1989 Forgotten Realms calendar on their walls (as I had on my own bedroom wall at the time)! 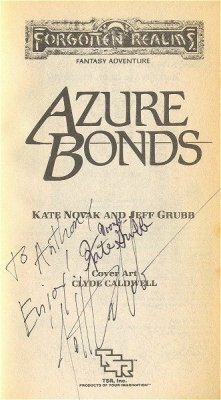 Scan of Jeff Grubb's autograph on the title page of my copy of Azure Bonds. The smaller signature is that of his wife and co author, Kate Novak (inscribed later when we met the pair for lunch at a nearby park).